That's ok. We're going to come over and pay our respects anyway. The move was delayed because the permit(s) didn't get issued (yet). It sounds like the actual move could take place on Monday, if the permit gets issued. GreatLakesRailfan wrote: That's ok. We're going to come over and pay our respects anyway. Part of the reason was that the reefer was supposed to go down M-6, but the construction is forcing it elsewhere. If it had been moved last weekend, or even this week, there wouldn't have been a problem, but apparently whoever issues the permits didn't find out what the detour route was until M-6 was shutdown. One of the things floating around today was that the permit won't be issued until the detour route can be checked for possible obstructions. Perhaps RaildudesDad can verify whether this is correct or scuttlebutt, as well as whether or not a permit would be issued for a weekend movement of an oversized trailer (it's somewhere around 14 feet tall)? There was some doubt that the movement would even be allowed on a weekend. Indeed, I'd be more interested as well to hear from RDD (or others) about this permitting process. It seems like M6 would have been the best route, as it is newer and constructed to higher standards for clearance, among other things, than what would seem to be the best alternative, which is to use the 1960s-era I-196 from Hudsonville to Thornapple, which itself has construction zones in downtown Grand Rapids, which may also pose a width restriction as well as height! Yes, there have been significant improvements to what is accepted in roadway designs today, and there are plenty of things built into the Interstate system when originally constructed which would not follow guidelines today! Construction guidelines are an interesting subject, one which I'm becoming acutely aware of this summer on my internship. For those who want to know what I'm talking about, here is the "tome" for Illinois projects, which pretty much tells you how to build a road in the State of Illinois using state funds...there is an entirely different set of guidelines for non-state projects. It has no fewer than 4336 pages in its current edition! Anyways...interesting move guys...hoping to see more soon! I will expound more when I'm off the clock but it's highly unlikely a permit for over height would be issued for the weekend. No one checks the route. It's "self serve" online. If you're too high for a segment you get rejected. And get to start over Very frustrating system. Who's the mover? Where exactly is this car that's being moved located at? Also what remains of the Ottawa Beach branch in terms of customers? How often is the branch served and by which train. The Ottawa Beach branch is served roughly twice a week by Y121. The only active customers are DeLuuw Lumber and Ryder Logistics. chapmaja wrote: Where exactly is this car that's being moved located at? Also what remains of the Ottawa Beach branch in terms of customers? How often is the branch served and by which train. Located next to Sluggo's Pizzeria at 321 Douglas Ave, Holland, MI 49424. 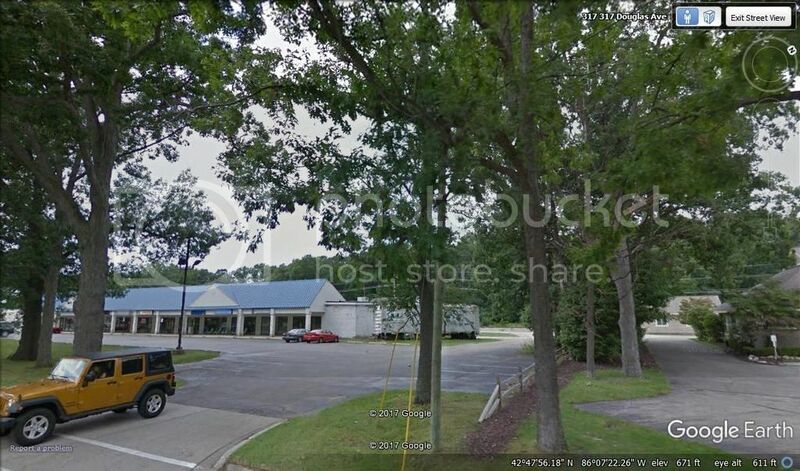 Ottawa Beach spur serves De Leeuw Lumber Co and Michigan Natural Storage(recently Ryder/TLC). A rough figure of once per week served, sometimes twice, done by Y121 based out of Holland. Is this the refer car I found on street view? Raildudes dad wrote: I will expound more when I'm off the clock but it's highly unlikely a permit for over height would be issued for the weekend. I'd appreciate that greatly. There seems to be a lot of bad information out there as to why the move didn't happen this weekend, and I think some of that is because a lot of us don't fully understand how this process works. I'd like to know a little more about what might have/probably happened, which probably wasn't translated correctly when the information was relayed amongst the small group that showed up to watch the work take place. I was initially surprised to hear they'd been issued a permit to move it on a weekend, although that obviously turned out not to be the case. Marc Kalis is the mover. Alex, the west end of the eastbound lanes of M-6 we're shut down for replacement earlier this weekend. Otherwise it doesn't sound like there would have been any issues nearly as significant as this that would have delayed the move. MDOT says they will issue a permit in 12 hours or less. My experience in getting permits is it can take only a hour or so IF everything is in order. The office is closed at 4:30 on Friday afternoon till 7:30 on Monday so one won't be issued over the weekend. I've also had the experience of working 8 hours to just get an application submitted. Very aggravating unfriendly system. At what point does a load need a permit to move? I assume there are statutory width, height and tonnage restrictions. Over length (varies on configuration - single, 2 unit or 3 unit, over width (102"), over height (13'6") and over weight (exceeding legal axle loads - varies on configuration 13,000 - 18,000 lbs). Any one requires a permit. Of all the limits, the axle loads are probably the biggest to watch. The fines are based on the amount of weight over you are, and they are not cheap. You would be shocked at the price of these fines. The over width is something that cops are cracking down on. Many of my customers who have moved their boats for years with no problems, are now getting nailed. Sounds like next weekend could finally see it roll out but nothing set in stone. MQT1223 wrote: Sounds like next weekend could finally see it roll out but nothing set in stone. With this project, it could be a while before anything moves...and when it does, nobody will know until about 6 hours before it's supposed to happen. Next to Brewery 4 Two 4 as well. And also very close to an old ROW that used to cross Douglas Ave. Actually, I wouldn't be surprised if the car has been sitting in a spot on the old alignment.